Collecting consumer feedback via reviews is one the most powerful ways to get search engine visibility. But it’s critical that consumers can trust the reviews. 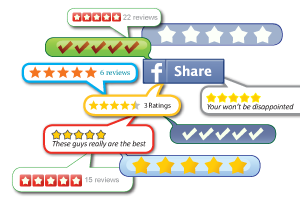 With SocialCRM, your customers post reviews with star ratings of your service to the Web and our system automatically verifies them as authentic. Trustworthy reviews from your actual customers put you one step ahead in managing your shop’s reputation. And, these reviews, with keywords added to optimize performance, create search engine-friendly links to drive your search visibility upward, where new customers can find you. Because customer transactions can be tracked by your shop management software, Mitchell 1 is your perfect partner to solicit reviews automatically and then verify that the customer’s transaction actually took place. We deliver the quality, quantity and velocity of consumer reviews that prove to the search engines that actual consumers are actively discussing your business. Because the link provided in the thank-you email you send to each customer is unique to your shop and that specific transaction, your reviews are automatically validated and given the stamp of approval from our partner, SureCritic.com, a leading provider of verified online customer reviews. Collecting customer email addresses and keeping them up to date can be a big challenge. If you are missing email addresses for some of your customers but would like to have them review your business online, SocialCRM’s phone review service can help. Our professional survey agents will contact your customers by telephone on your shop’s behalf to collect reviews which are then posted to your SureCritic review page. Receive additional feedback automatically when your shop receives a low score in a consumer review, so you can respond quickly to resolve potential satisfaction issues and build your business’s reputation. Consumers who submit a negative review (three or fewer stars out of five stars) will be invited to provide more detail in a brief survey about their experience. This extra information allows you to monitor and respond in near real-time to consumers who are not fully satisfied with their auto repair. You can also share the documented feedback with shop personnel to improve employee performance and operational processes. Build and amplify positive word of mouth through automatic — “syndication” — of your customers’ reviews. The SocialCRM review syndication service publishes your reviews across local search directories, along with your shop’s contact information, hours of operation, and trackable appointment link. This is an excellent way to amplify each consumer review across the Internet. With your SocialCRM product integrated with Mitchell 1’s Manager™ SE shop management system, you will be notified automatically every time your business receives a new consumer review. Just click the “SocialCRM Reports” button in Manager SE to see the reviews and access details such as marketing touch points by vehicle, corresponding invoices, reviews for specific customers, verification of customer vehicles owned, and customer e-mail address information. Having these details helps you establish a deeper relationship with your customers through effective communication, which in turn will allow you to leverage those relationships to grow your business through word-of-mouth marketing. Increase the search relevancy of your SureCritic review page even more by adding a detailed description of your shop and applying service categories. This is just one more way the SureCritic data is optimized for Internet search engines like Google™. Your review data and your personal business review page content are optimized and indexed by all the most popular Internet search engines like Google. We create a unique URL address for each review, giving you the best visibility possible. You can log in and comment on any review — and thank your loyal customers for their business and their positive feedback about their experience at your shop. If a consumer has given you a low rating, SureCritic’s industry-leading ReScore feature provides a process to raise your rating. You have an opportunity to communicate with the consumer to resolve their concern, and then ask them to revise their review rating based on the service and resolution you have provided. It’s another chance to proactively manage your shop’s reputation. You’ll get automatic email notification when you receive a low score so you’ll have plenty of time to respond to your customer’s concern and resolve the issue. You have the opportunity to improve their satisfaction with their experience —and their rating of your business. SureCritic helps your business collect more authentic customer experiences than any other review site. The Social Engage feature helps convert your customers into advocates for your business. After your customer completes their SureCritic review, they are presented with options to also create a Google Places review and/or share their SureCritic review with friends and family, thus amplifying their positive experience across numerous social media platforms.